Anne P. Waddell is one of America’s most versatile artists. Well known, at first, for her equine art, she has now expanded to yachting art and ocean scenes. Anne P. Waddell was born in Washington State and has lived many places in America and abroad. Originally, her main focus was in equine art but changed courses, when she moved to La Jolla California, to specialize in yachting art. Anne P. Waddell is inspired by a variety of compositions that reflect her wide range of personal experiences including those as a sailor and an equestrian. Anne became a professional artist when she sold her first watercolor painting in 1977. Since then, Anne P. Waddell has had several one man shows in Virginia and California. Her black and white print, “Groom with Horse” won the prestigious “Print of the Year” award in 1983. (a limited amount of these are still available under the Art for Sale link.) and was displayed for years at the White House. 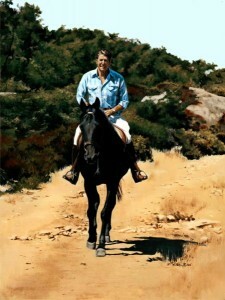 Her painting of “Ronald Reagan on Little Man” at Rancho Del Cielo, California was commissioned by the President’s Council on Physical Fitness and the original oil painting is display in the Ronald Reagan Library. Mrs. Waddell has one color and four black and white prints for sale. Her original work is rarely available because she works almost solely on commission. If you are interested in a commissioned painting or drawing, please contact the artist. Occasionally, you will see originals for sale on this website. Her work is done primarily with oils with some graphite and gouache works as well.